It's been a while since I did a Bible character biography - and it's not from lack of inspiration or motivation. I just haven't found or made the time. But I'm changing that - because I've been thinking about profiling this particular Bible character for at least a month - and he's told me he's not planning to wait much longer. So, here I go. Mephibosheth was the son of Jonathan and the grandfather of King Saul. He is first mentioned briefly in 2 Samuel 4:4, and his story is told off and on in 2 Samuel 9-19. The first mention of Mephibosheth is not an encouraging one. He definitely started off on the wrong foot (excuse the pun. Please!). At the age of five, both his father Jonathan and grandfather Saul were killed in battle. When his nurse heard the news, she picked him up and left his home, fearing for their lives. In the process, she dropped him and he became lame in both feet. Yet, he was still an heir to his grandfather's throne - a throne David had taken over. And this undoubtedly made this man nervous. But his father and the new king had pledged their friendship to each other and their descendants forever (1 Samuel 20:42), so he needn't have worried. Once David's reign was fully established, he decided to make good on his pledge. He learned of Mephibosheth from Saul's old servant Ziba, and invited his best friend's son to eat at the king's table, and granted him the land that once belonged to his grandfather Saul (he ordered Ziba and his descendants to care for the land). (2 Samuel 9:1-13 And Mephibosheth became devoted to David for life. 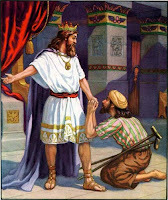 As King David was leaving Jerusalem because Absalom's insurrection, Mephibosheth's servant Ziba reported that his charge had for all intents and purposes betrayed the king. And David took Ziba at his word. A few chapters later, however, when David returned to Jerusalem victorious, Mephibosheth approached the king, claiming his innocence. He told David that Ziba had refused to saddle a donkey for Mephibosheth, which trapped the man in Jerusalem when he wanted to join his king in exile. He had not attempted to regain the throne for his family, the lame man said. 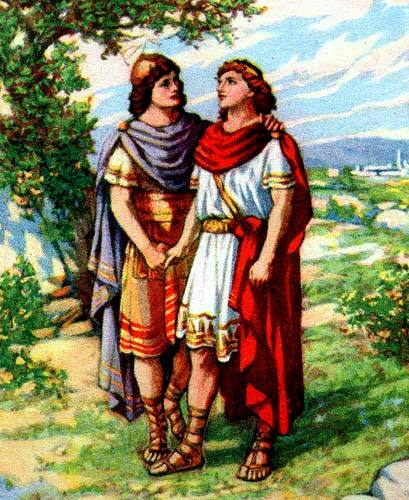 (2 Samuel 19:26-27) David, after hearing both sides, made his ruling. So, who was telling the truth? Most believe it was Mephibosheth - and I am among them. According to the text, when Mephibosheth approached David in 2 Samuel 19:24, "he had not taken care of his feet or trimmed his mustache or washed his clothes from the day the king left until the day he returned safely." That doesn't sound like the actions of a traitor. And his response to David's decision to divide the land? Again, sounds like a devoted follower to me. There are so many different ways to relate to Mephibosheth. A child of the enemy - accepted by the king. The imperfect man - accepted anyway. A devoted follower. A betrayed person. The misunderstood. And more. In what ways are you like Mephibosheth? What can we learn from him? Interesting and illuminating. The name captured me, the story captivated. Thanks so much. Fascinating character, isn't he? Thanks for stopping by, Linda! Jo, I remember Mephi's story of being taken in by David, but didn't remember that he was one of those who was accused (wrongly or not) of trying to take the throne. There so many! Thanks for this character study. I love your character studies, Jo. I was just reading this in my year in the Bible, but have to go back and reread to pick up these nuances. Thanks, Lisa - it's amazing how we can read the Bible over and over, and pick up something new every time. Thanks for stopping by, my friend!